23.2 Scientific Research: Asterism or Open Cluster? The Whirlpool Galaxy (also known as Messier 51a, M51a, or NGC 5194) is an interacting grand-design w:spiral galaxy located at a distance of approximately 31 million w:light-years in the w:constellation w:Canes Venatici. It is one of the most famous spiral galaxies in the sky. The galaxy and its companion (w:NGC 5195) are easily observed by amateur astronomers, and the two galaxies may even be seen with w:binoculars. The Whirlpool Galaxy is also a popular target for professional astronomers, who study it to further understanding of galaxy structure (particularly structure associated with the spiral arms) and galaxy interactions. 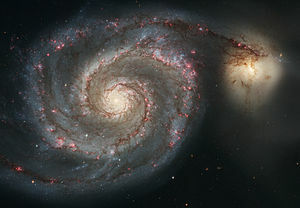 What was later known as the Whirlpool Galaxy, was discovered in 1774 by w:Charles Messier, and is designated as M51. Its companion galaxy, w:NGC 5195, was discovered in 1781 by w:Pierre Méchain. It was however not until 1845 that the Whirlpool became the first to be recognized as a spiral. This was achieved by Lord Rosse employing a 72-inch (~1.83 m) reflecting telescope which he constructed at w:Birr Castle, Ireland. Sometimes M51 is used to refer to the pair of galaxies, in which case the individual galaxies may be referred to as M51A (NGC 5194) and M51B (NGC 5195). In 2005 a w:supernova (w:SN 2005cs) was observed in the Whirlpool Galaxy, peaking at w:apparent magnitude 14. With the recent SN 2008cs derived estimate of 23 Mly distance, and an angular diameter of roughly 11.2′, it can be inferred that M51's bright circular disk has a radius of about ~38,000 light-years. Its w:mass is estimated to be 160 billion solar masses. thumb|right|200px|The cross within the nucleus of M51 indicating two dust rings around the black hole at the center of the nebulaA w:black hole, surrounded by a ring of dust, is thought to exist at the heart of the spiral. The dust ring stands almost perpendicular to the relatively flat spiral nebula. A secondary ring crosses the primary ring on a different axis, a phenomenon that is contrary to expectations. A pair of w:ionization cones extend from the axis of the main dust ring. Located within the constellation w:Canes Venatici, M51 is found by following the easternmost star of the w:Big Dipper, w:Eta Ursae Majoris, and going 3.5° southeast. Its declination is +47°, making it a circumpolar for observers located above 43°N latitude; it reaches high altitudes throughout the northern hemisphere making it an accessible object from the early hours in winter through the end of spring season, after which observation is hindered in lower lattitudes. M51 is visible through binoculars under dark sky conditions and can be resolved in detail with modern amateur telescopes. When seen through a 100 mm telescope the basic outlines of M51 and its companion are visible. Under dark skies, and with a moderate eyepiece through a 150 mm telescope, M51's intrinsic spiral structure can be detected. With larger (>300 mm) instruments under dark sky conditions, the various spiral bands are apparent with w:HII regions visible, and M51 can be seen to be attached to w:M51B. In January 2005 the Hubble Heritage Team constructed a 11477x7965 pixel composite image (shown in the info box above) of M51 using Hubble's ACS instrument. The very pronounced spiral structure of the Whirlpool Galaxy is believed to be the result of the close interaction between it and its companion galaxy w:NGC 5195. Induced spiral structure in the larger galaxy isn't the only effect of the interaction. Significant compression of hydrogen gas occurs that leads to the development of starbirth regions. In pictures of M51 these show up as the bright blue 'knots' throughout the spiral arms. Generally speaking, hydrogen gas is the most common component of the w:interstellar medium (the vast space between stars and planetary systems in galaxies). It exists primarily in its atomic and molecular form, and forms huge clouds throughout the entire galaxy. When large sources of gravitational pull pass nearby, such as other galaxies, gravitational interactions produce compression (density) waves that sweep through these hydrogen clouds. This causes some regions of the previously diffuse gas to compress into tight pockets of opaque and dense gas, these are dust lanes one so often sees in the spiral arms. In regions where the concentration and density of gas reaches a critical value, further collapse under its own gravitational pull occurs, and stars are born at the center of the collapse, where the gas is compressed so strongly that fusion initiates. When this happens, these new-born stars gobble up huge amounts of gas causing them to expand, shine even hotter, and finally sweep away the surrounding layers of dust and gas by increasing efflux of the stellar wind. The gigantic proportions of the clouds out of which they are born means stars seldom, if ever, are created in isolation. Thus regions of several hot young stars emit sufficient light energy that they can be seen in the high resolution pictures of M51 across millions of lightyears distance. For an example of such a formation in our own galaxy, see M16, the w:Eagle Nebula. Decades ago, it was not known with certainty whether the companion galaxy NGC 5195 was a true companion, or another galaxy passing at a distance. The advent of radio astronomy and subsequent radio images of M51 unequivocally demonstrated the reality of the interaction. Recent simulations bear out that M51's spiral structure was caused by NGC 5195 passing through the main disk of M51 about 500 to 600 million years ago. In this model, NGC 5195 came from behind M51 through the disk towards the observer and made another disk crossing as recently as 50 to 100 Myrs ago until it is where we observe it to be now, slightly behind M51. The Whirlpool Galaxy is the brightest galaxy in the w:M51 Group, a small w:group of galaxies that also includes M63 (the Sunflower Galaxy), w:NGC 5023, and w:NGC 5229. This small group may actually be a subclump at the southeast end of a large, elongated group that includes the w:M101 Group and the w:NGC 5866 Group, although most group identification methods and catalogs identify the three groups as separate entities. This galaxy is featured in the "w:Homeworld" RTS Franchise, which is home to a human-like race of beings called "Hiigarans". This galaxy is also in "w:The Genesis Quest" and "w:Second Genesis" by w:Donald Moffitt, and is the home galaxy for the aliens known as "The Nar". ↑ a b c d e f g h i j k l m n o "NASA/IPAC Extragalactic Database". Results for NGC 5194. http://nedwww.ipac.caltech.edu/. Retrieved 2006-12-06. ↑ Takáts, K.; Vinkó, J. (2006). "Distance estimate and progenitor characteristics of SN 2005cs in M51". Monthly Notices of the Royal Astronomical Society, Online Early 372: 1735. doi:10.1111/j.1365-2966.2006.10974.x. http://adsabs.harvard.edu/cgi-bin/nph-bib_query?doi=10.1111%2Fj.1365-2966.2006.10974.x. ↑ a b H. Arp (1966). "Atlas of Peculiar Galaxies". Astrophysical Journal Supplement 14: 1–20. doi:10.1086/190147. http://adsabs.harvard.edu/abs/1966ApJS...14....1A. ↑ D. M. Elmegreen, B. G. Elmegreen (1987). "Arm classifications for spiral galaxies". Astrophysical Journal 314: 3–9. doi:10.1086/165034. http://adsabs.harvard.edu/abs/1987ApJ...314....3E. ↑ Nemiroff, Robert; Jerry Bonnell (2000-07-24). "Astronomy Picture of the Day". nasa.gov. http://apod.nasa.gov/apod/ap000724.html. Retrieved 2007-04-22. ↑ MacRobert, Alan M. (w:August 24 w:2005). "Supernova in M51". Sky Tonight. Sky and Telescope. http://skyandtelescope.com/news/article_1544_1.asp. Retrieved August 7, 2006. ↑ Bishop, David. "Supernova 2005cs in M51". supernovae.net. http://www.supernovae.net/sn2005/sn2005cs.html. Retrieved August 7, 2006. ↑ "NASA's Hubble Space Telescope Resolves a Dark "x" Across the Nucleus of M51". News Center. HubbleSite. w:June 8 w:1992. http://hubblesite.org/newscenter/newsdesk/archive/releases/1992/17/text/. Retrieved August 7, 2006. ↑ "Out of This Whirl: the Whirlpool Galaxy (M51) and Companion Galaxy". News Center. HubbleSite. w:April 25 w:2005. http://hubblesite.org/newscenter/newsdesk/archive/releases/2005/12/image/a. Retrieved August 7, 2006. ↑ Salo, Heikki; Laurikainen, Eija (1999). "A Multiple Encounter Model of M51". Astrophysics and Space Science 269/270: 663–664. doi:10.1023/A:1017002909665. http://adsabs.harvard.edu/cgi-bin/nph-bib_query?bibcode=1999Ap%26SS.269..663S. ↑ L. Ferrarese, H. C. Ford, J. Huchra, R. C. Kennicutt Jr., J. R. Mould, S. Sakai, W. L. Freedman, P. B. Stetson, B. F. Madore, B. K. Gibson, J. A. Graham, S. M. Hughes, G. D. Illingworth, D. D. Kelson, L. Macri, K. Sebo, N. A. Silbermann (2000). "A Database of Cepheid Distance Moduli and Tip of the Red Giant Branch, Globular Cluster Luminosity Function, Planetary Nebula Luminosity Function, and Surface Brightness Fluctuation Data Useful for Distance Determinations". Astrophysical Journal Supplement 128: 431–459. doi:10.1086/313391. http://adsabs.harvard.edu/abs/2000ApJS..128..431F. Messier 53 (also known as M53, or NGC 5024) is a w:globular cluster in the w:Coma Berenices constellation. It was discovered by w:Johann Elert Bode in w:1775. M53 is one of the more outlying globular clusters, being about 60,000 w:light-years away from the w:Galactic Center, and almost the same distance (about 58,000 light-years) from the w:Solar system. ↑ a b c d "SIMBAD Astronomical Database". Results for NGC 5024. http://simbad.u-strasbg.fr/Simbad. Retrieved 2006-11-16. Messier 54 (also known as M54 or NGC 6715) is a w:globular cluster in the w:constellation Sagittarius. It was discovered by w:Charles Messier in w:1778 and subsequently included in his catalog of w:comet-like objects. Previously thought to be at a distance from w:Earth of about 50,000 w:light-years, it was discovered in w:1994 that M54 was most likely not part of the w:Milky Way, but actually part of the w:Sagittarius Dwarf Elliptical Galaxy, (SagDEG), making it the first extragalactic globular cluster ever discovered, even if it wasn't recognized as such for nearly two and a quarter centuries. Modern estimates now place M54 at a distance of some 87,000 light-years, translating into a true radius of 150 light-years across. It is one of the denser of the globulars, being of class III (I being densest and XII being the least dense). It shines with the w:luminosity of roughly 850,000 times that of the w:Sun and has an w:absolute magnitude of -10.0. M54 is easily found on the sky, being close to the w:star ζ Sagittarii. It is however, not resolvable into individual stars even with larger amateur w:telescopes. In July of 2009, a team of astronomers reported that they had found evidence of an w:intermediate-mass black hole in the core of M54. This was the first report of such a black hole in any globular cluster. ↑ a b c d e f "SIMBAD Astronomical Database". Results for NGC 6715. http://simbad.u-strasbg.fr/Simbad. Retrieved 2006-11-16. Messier 55 (also known as M55 or NGC 6809) is a w:globular cluster in the w:constellation Sagittarius. It was discovered by w:Nicolas Louis de Lacaille in w:1751 and catalogued by w:Charles Messier in w:1778. M55 is at a distance of about 17,300 w:light-years away from w:Earth. Only about half a dozen w:variable stars have been discovered in M55. ↑ a b c d "SIMBAD Astronomical Database". Results for NGC 6809. http://simbad.u-strasbg.fr/Simbad. Retrieved 2006-11-16. Messier 62 (also known as M62 or NGC 6266) is a w:globular cluster in the w:constellation w:Ophiuchus. It was discovered in w:1771 by w:Charles Messier. M62 is at a distance of about 22,500 w:light-years from w:Earth and measures some 100 light-years across. From studies conducted in the 1970s it is known that M62 contains the high number of 89 w:variable stars, many of them of the w:RR Lyrae type. The globular also contains a number of w:x-ray sources, thought to be close w:binary star systems, and millisecond w:pulsars in binary systems. ↑ a b c d "SIMBAD Astronomical Database". Results for NGC 6266. http://simbad.u-strasbg.fr/Simbad. Retrieved 2006-11-17. The Black Eye Galaxy (also called Sleeping Beauty Galaxy; designated Messier 64, M64, or NGC 4826) was discovered by w:Edward Pigott in March 1779, and independently by w:Johann Elert Bode in April of the same year, as well as by w:Charles Messier in 1780. It has a spectacular dark band of absorbing dust in front of the galaxy's bright nucleus, giving rise to its nicknames of the "Black Eye" or "Evil Eye" galaxy. M64 is well known among amateur astronomers because of its appearance in small w:telescopes. It is a w:spiral galaxy in the Coma Berenices constellation. At first glance, M64 seems to be a fairly normal spiral galaxy. As in the majority of galaxies, all of the stars in M64 are orbiting in the same direction, clockwise as seen in the Hubble image. However, recent detailed studies have led to the remarkable discovery that the interstellar gas in the outer regions of M64 rotates in the opposite direction from the gas and stars in the inner regions. The inner region has a radius of only approximately 3,000 light-years, while the outer section extends another 40,000 light-years. This pattern is believed to trigger the creation of many new stars around the boundary separating the two regions. A collision of two galaxies has left a merged star system with an unusual appearance as well as bizarre internal motions. Astronomers believe that the oppositely rotating gas arose when M64 absorbed a satellite galaxy that collided with it, perhaps more than one billion years ago. Active formation of new stars is occurring in the shear region where the oppositely rotating gases collide, are compressed, and contract. Particularly noticeable in the image are hot, blue young stars that have just formed, along with pink clouds of glowing hydrogen gas that fluoresce when exposed to w:ultraviolet light from newly formed stars. It is approximately 17 million light years from earth. The small galaxy that impinged on its neighbour has now been almost completely destroyed, its stars either merged with the main galaxy or scattered into space, but signs of the collision persist in the backward motion of gas at the outer edge of M64. ↑ a b c d e f g "NASA/IPAC Extragalactic Database". Results for NGC 4826. http://nedwww.ipac.caltech.edu/. Retrieved 2006-11-06. ↑ "Centre de Données astronomiques de Strasbourg". Results for M 64 -- Seyfert Galaxy. http://simbad.u-strasbg.fr/simbad/sim-id?Ident=M64. Retrieved 2008-07-09. Messier 69 (also known as M69 or NGC 6637) is a w:globular cluster in the w:constellation Sagittarius. It was discovered by w:Charles Messier in August 31, w:1780, the same night he discovered M70. At the time, he was searching for an object described by LaCaille in 1751-2 and thought he had rediscovered it, but it is unclear if LaCaille actually described M69. M69 is at a distance of about 29,700 w:light-years away from w:Earth and has a spatial radius of 42 light-years. It is a close neighbor of w:Globular Cluster M70, 1,800 light-years separating the two objects, and both these clusters lie close to the Galactic Center. It is one of the most metal-rich globular cluster known. ↑ a b c d "SIMBAD Astronomical Database". Results for NGC 6637. http://simbad.u-strasbg.fr/Simbad. Retrieved 2006-11-17. Messier 70 (also known as M70 or NGC 6681) is a w:globular cluster in the w:constellation Sagittarius. It was discovered by w:Charles Messier in w:1780. M70 is at a distance of about 29,300 w:light years away from w:Earth and close to the w:Galactic Center. It is roughly the same size and w:luminosity as its neighbour in space, w:Globular Cluster M69. Only 2 w:variable stars are known within this cluster. ↑ a b c d "SIMBAD Astronomical Database". Results for NGC 6681. http://simbad.u-strasbg.fr/Simbad. Retrieved 2006-11-17. Messier 72 (also known as M72 or NGC 6981) is a w:globular cluster in the Aquarius constellation discovered by w:Pierre Méchain in w:August 29 w:1780. w:Charles Messier looked for it on the following w:October 4 and 5, and included it in his catalog. Both decided that it was a faint nebula not a cluster as is now believed. Using 10-inch (250 mm) telescopes, viewing the cluster is difficult resulting in only a view of a faint blurry picture, However using Kopernicks' 20-inch (510 mm) telescope resolution is highly increased. M72 is located at about 53,000 w:light-years away from w:Earth and lies in a considerable distance beyond the w:Galactic Center. Another source states that the cluster is 62,000 light-years away, with a diameter of 42 light-years. Generally considered a young cluster, the cluster has several blue giants, yet star clusters generally contain the oldest stars. ↑ a b c "SIMBAD Astronomical Database". Results for NGC 6981. http://simbad.u-strasbg.fr/Simbad. Retrieved 2006-11-16. Messier 73 (also known as M73 and NGC 6994) is an asterism of four w:stars in the constellation of Aquarius. An asterism is comprised of physically unconnected stars that appear close to each other in the sky as seen from Earth. M73 is one of the best-known asterisms in the sky, and it has been carefully studied scientifically. M73 was discovered by w:Charles Messier on w:October 4, w:1780, who originally described the object as a cluster of four stars with some nebulosity. Subsequent observations by w:John Herschel, however, failed to reveal any nebulosity. Moreover, Herschel noted that the designation of M73 as a cluster was questionable. Nonetheless, Herschel included M73 in his General Catalogue of clusters, w:nebulae, and w:galaxies, and John Dreyer included M73 when he compiled the w:New General Catalogue. Scientific Research: Asterism or Open Cluster? M73 was once treated as a potential sparsely populated w:open cluster, which consists of stars that are physically associated in space as well as on the sky. The question of whether the stars were an asterism or an open cluster generated a small, interesting debate. In 2000, L. P. Bassino, S. Waldhausen, and R. E. Martinez published an analysis of the colors and luminosities of the stars in and around M73. They concluded that the four bright central stars and some other nearby stars followed the color-luminosity relation that is also followed by stars in open clusters (as seen in a w:Hertzsprung-Russell diagram). Their conclusion was that M73 was an old open cluster that was 9 arcmin wide. G. Carraro, however, published results in 2000 based on a similar analysis and concluded that the stars did not follow any color-luminosity relation. Carraro's conclusion was that M73 was an asterism. Adding to the controversy, E. Bica and collaborators concluded that the chance alignment of the four bright stars seen in the center of M73 as well as one other nearby star was highly unlikely, so M73 was probably a sparse open cluster. The controversy was solved in 2002, when M. Odenkirchen and C. Soubiran published an analysis of the high resolution w:spectra of the six brightest stars within 6 arcmin of the central position of M73. Odenkirchen and Soubiran demonstrated that the distances from the Earth to the six stars were very different from each other, and the stars were moving in different directions. Therefore, they concluded that the stars were only an asterism. Although M73 was determined to be only a chance alignment of stars, further analysis of asterisms is still important for the identification of sparsely populated open clusters. Such clusters can be important for demonstrating how open clusters are ripped apart by the gravitational forces in the w:Milky Way. ↑ a b c d e "SIMBAD Astronomical Database". Results for Messier 73. http://simbad.u-strasbg.fr/Simbad. Retrieved 2006-12-21. ↑ L. P. Bassino, S. Waldhausen, & R. E. Martinez (2000). "CCD photometry in the region of NGC 6994: The remains of an old open cluster". Astronomy & Astrophysics 355: 138–144. http://adsabs.harvard.edu/abs/2000A&A...355..138B. ↑ G. Carraro (2000). "NGC 6994: An open cluster which is not an open cluster". Astronomy & Astrophysics 357: 145–148. http://adsabs.harvard.edu/abs/2000A&A...357..145C. ↑ E. Bica, B. X. Santiago, C. M. Dutra, H. Dottori, M. R. de Oliveira, & D. Pavani (2001). "Dissolving star cluster candidates". Astronomy & Astrophysics 366: 827–833. doi:10.1051/0004-6361:20000248. http://adsabs.harvard.edu/abs/2001A&A...366..827B. ↑ M. Odenkirchen & C. Soubiran (2002). "NGC 6994: - clearly not a physical stellar ensemble". Astronomy & Astrophysics 383: 163–170. doi:10.1051/0004-6361:20011730. http://adsabs.harvard.edu/abs/2002A&A...383..163O. Messier 74 (also known as NGC 628) is a face-on w:spiral galaxy in the w:constellation Pisces. The galaxy contains two clearly-defined w:spiral arms and is therefore used as an archetypal example of a w:Grand Design Spiral Galaxy. The galaxy's low surface brightness makes it the most difficult Messier object for amateur astronomers to observe. However, the relatively large angular size of the galaxy and the galaxy's face-on orientation make it an ideal object for professional astronomers who want to study w:spiral arm structure and spiral density waves. M74 was discovered by w:Pierre Méchain in w:1780. Méchain then communicated his discovery to w:Charles Messier, who listed the galaxy in his catalog. Two w:supernovae have been identified in M74: w:SN 2002ap and w:SN 2003gd. SN 2002ap has attracted considerable attention because it is one of the few Type Ic supernovae (or w:hypernovae) observed within 10 Mpc in recent years. This supernovae has been used to test theories on the origins of similar Type Ic supernovae at higher distances and theories on the connection between supernovae and w:gamma ray bursts. SN 2003gd is a Type II-P supernova. Type II supernovae have known luminosities, so they can be used to accurately measure distances. The distance measured to M74 using SN 2003gd is 9.6 ± 2.8 Mpc, or 31 ± 9 million ly. For comparison, distances measured using the brightest supergiants are 7.7 ± 1.7 Mpc and 9.6 ± 2.2 Mpc. Ben E. K. Sugerman found a "light echo" - a reflection of supernova explosion that appeared after the explosion itself - associated with SN 2003gd. This is one of the few supernovae in which such a reflection has been found. This reflection appears to be from dust in a sheet-like cloud that lies in front of the supernova, and it can be used to determine the composition of the interstellar dust. M74 is the brightest member of the w:M74 Group, a group of 5-7 galaxies that also includes the peculiar w:spiral galaxy w:NGC 660 and a few w:irregular galaxies. Although different group identification methods may consistently identify many of the same member galaxies in this group, the exact group membership is still uncertain. M74 as observed with the w:Spitzer Space Telescope as part of the w:Spitzer Infrared Nearby Galaxy Survey. The blue colors represent the 3.6 micrometre emission from stars. The green and red colors represent the 5.8 and 8.0 micrometre emission from w:polycyclic aromatic hydrocarbons and possibly dust. In w:March 22, w:2005, it was announced  that the w:Chandra X-ray Observatory had observed an w:ultraluminous X-ray source (ULX) in M74, radiating more X-ray power than a w:neutron star in periodic intervals of around two hours. It has an estimated mass of around 10,000 w:Suns. This is an indicator of an w:intermediate-mass black hole. This would be a rather uncommon class of black holes, somewhere in between in size of stellar black holes and the massive black holes theorized to reside in the center of many galaxies. Because of this, they are believed to form not from single supernovae, but possibly from a number of lesser stellar black holes in a star cluster. The X-ray source is identified as CXOU J013651.1+154547. Messier 74 is located 1.5° east-northeast of w:Eta Piscium. As stated above, the galaxy has the lowest surface brightness of all the Messier objects. It may be very difficult to see unless the sky is dark and clear, and it may be difficult to see in locations affected by w:light pollution. The galaxy may be best viewed under low magnification; when highly magnified, the diffuse emission becomes more extended and appears too faint to be seen by many people. Additionally, the galaxy may be more easily seen when using w:averted vision when the eyes are fully dark adapted. ↑ a b c d e f g h "NASA/IPAC Extragalactic Database". Results for NGC 628. http://nedwww.ipac.caltech.edu/. Retrieved 2006-08-12. ↑ a b c M. A. Hendry, S. J. Smartt, J. R. Maund, A. Pastorello, L. Zampieri, S. Benetti, M. Turatto, E. Cappellaro, W. P. S. Meikle, R. Kotak, M. J. Irwin, P. G. Jonker, L. Vermaas, R. F. Peletier, H. van Woerden, K. M. Exter, D. L. Pollacco, S. Leon, S. Verley, C. R. Benn, G. Pignata (2005). "A study of the Type II-P supernova 2003gd in M74". Monthly Notices of the Royal Astronomical Society 359: 906–926. doi:10.1111/j.1365-2966.2005.08928.x. http://adsabs.harvard.edu/abs/2005MNRAS.359..906H. ↑ a b c d e f K. G. Jones (1991). Messier's Nebulae and Star Clusters (2nd ed.). Cambridge: Cambridge University Press. ISBN 0-521-37079-5. ↑ S. Nakano, R. Kushida, Y. Kushida, W. Li (2002). "Supernova 2002ap in M74". IAU Circular 7810. http://adsabs.harvard.edu/abs/2002IAUC.7810....1N. ↑ R. Evans, R. H. McNaught (2003). "Supernova 2003gd in M74". IAU Circular 8150. http://adsabs.harvard.edu/abs/2003IAUC.8150....2E. ↑ P. A. Mazzali, J. Deng, K. Maeda, K. Nomoto, H. Umeda, K. hatano, K. Iwamoto, Y. Yoshii, Y. Kobayashi, T. Minezaki, M. Doi, K. Enya, H. Tomita, S. J. Smartt, K. Kinugasa, H. Kawakita, K. Ayani, T. Kawabata, H. Yamaoka, Y. L. Qiu, K. Motohara, C. L. Gerardy, R. Fesen, K. S. Kawabata, M. Iye, N. Kashikawa, G. Kosugi, Y. Ohyama, M. Takada-Hidai, G. Zhao, R. Chornock, A. V. Filippenko, S. Benetti, M. Turatto (2002). "The Type Ic Hypernova SN 2002ap". Astrophysical Journal 572: L61–L65. doi:10.1086/341504. http://adsabs.harvard.edu/abs/2002ApJ...572L..61M. ↑ a b S. J. Smartt, P. M. Vreeswijk, E. Ramirez-Ruiz, G. F. Gilmore, W. P. S. Meikle, A. M. N. Ferguson, J. H. Knapen (2002). "On the Progenitor of the Type Ic Supernova 2002ap". Astrophysical Journal 572: L147–L151. doi:10.1086/341747. http://adsabs.harvard.edu/abs/2002ApJ...572L.147S. ↑ a b A. Gal-Yam, E. O. Ofek, O. Shemmer (2002). "Supernova 2002ap: the first month". Monthly Notices of the Royal Astronomical Society 332: L73–L77. doi:10.1046/j.1365-8711.2002.05535.x. http://adsabs.harvard.edu/abs/2002MNRAS.332L..73G. ↑ S. D. Van Dyk, W. Li, A. V. Filippenko (2003). "On the Progenitor of the Type II-Plateau Supernova 2003gd in M74". Publications of the Astronomical Society of the Pacific 115: 1289–1295. doi:10.1086/378308. http://adsabs.harvard.edu/abs/2003PASP..115.1289V. ↑ a b B. E. K. Sugerman (2005). "Discovery of a Light Echo from SN 2003gd". Astrophysical Journal 632: L17–L20. doi:10.1086/497578. http://adsabs.harvard.edu/abs/2005ApJ...632L..17S. ↑ S. D. Van Dyk, W. Li, A. V. Filippenko (2006). "The Light Echo around Supernova 2003gd in Messier 74". Publications of the Astronomical Society of the Pacific 118: 351–357. doi:10.1086/500225. http://adsabs.harvard.edu/abs/2006PASP..118..351V. ↑ a b G. Giuricin, C. Marinoni, L. Ceriani, A. Pisani (2000). "Nearby Optical Galaxies: Selection of the Sample and Identification of Groups". Astrophysical Journal 543: 178–194. doi:10.1086/317070. http://adsabs.harvard.edu/abs/2000ApJ...543..178G. Messier 75 (also known as M75 or NGC 6864) is a w:globular cluster in the w:constellation Sagittarius. It was discovered by w:Pierre Méchain in w:1780 and included in w:Charles Messier's catalog of w:comet-like objects that same year. M75 is at a distance of about 67,500 w:light years away from w:Earth and its apparent size on the sky translates to a true radius of some 67 w:light years. It is classified as class I, meaning it is one of the more densely concentrated globular clusters known. The w:absolute magnitude of M75 is about -8.5 or some 180,000 more luminous than the w:Sun. ↑ a b c d "SIMBAD Astronomical Database". Results for NGC 6864. http://simbad.u-strasbg.fr/Simbad. Retrieved 2006-11-16. This page was last edited on 11 September 2018, at 23:11.